NSEP manufactures drying conveyors to meet the specific needs of each application. 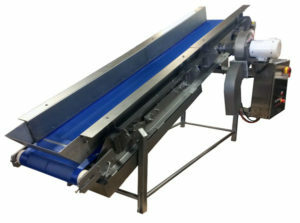 Typically the conveyor is manufactured with blue mesh (2mm openings) food grade conveyor belting to provide good drainage. In addition a vacuum section can be added under the belt, as well as air knives on top. Eccentric thumpers bounce the product to spread it and turn it for effective water removal.